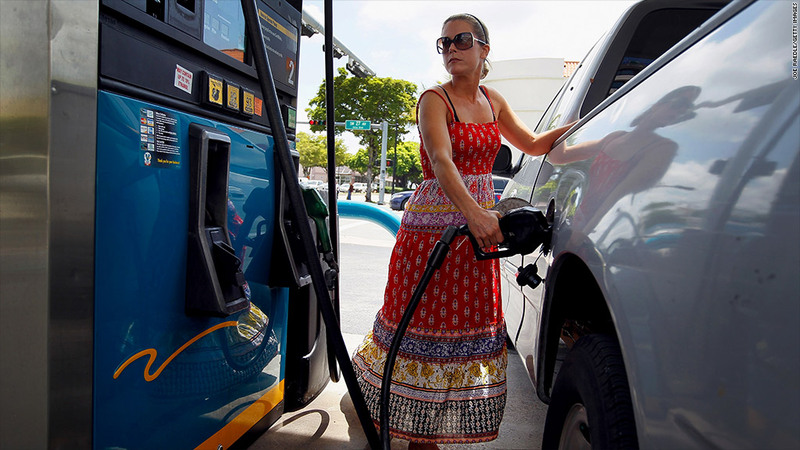 Consumers' spending on transportation rose as gas prices soared. Consumers opened their wallets last year, spending an average 3.3% more on household expenditures than they did in 2010, according to federal data released Tuesday. Average annual spending rose to$49,705, the first yearly increase since 2008, the height of the Great Recession. But hold off on popping the champagne...when you take inflation into account, spending hardly budged at all. Inflation increased 3.2% last year. Consumers spent more on necessities, such as food, transportation and health care, but held back on splurging on other purchases, such as entertainment and apparel, which had much smaller increases. That's in part because the economy is still weak and the job market still rocky, experts said. "People are cautious of spending because they don't know what's coming up," said Diana Furchtgott-Roth, senior fellow at the Manhattan Institute. Spending on transportation rose 8% to an average $8,293 in 2011, with outlays on gas climbing 24.5%, according to the annual consumer expenditures survey from the Bureau of Labor Statistics. The average nationwide price for a gallon of regular gas rose 26.4%. The increase in gas prices is hitting families hard, particularly those at the lower end of the income scale, Furchtgott-Roth said. Those who make the least spend 12.2% of their income on gas, versus 2.7% of the highest earners. Americans spent more on food -- both at supermarkets and restaurants. Overall spending on food increased 5.4% to $6,458. A year earlier, spending on food had dropped 3.8%. Cash contributions, which includes payments to support college students, alimony and child support and charitable giving, also rose 5.4%, while health care spending jumped 4.9%. To fuel these outlays, consumers dipped into their savings more, said Scott Hoyt, senior director of consumer economics for Moody's Analytics. Spending increased faster than average income, which rose only 1.9% in 2011. The lowest income folks saw the smallest rise in average income, less than half of 1%. But their spending increased by 5%, up to 218% of their income. At the other end of the scale, the richest fifth got to pocket more of their income, which rose 2.1%, compared to a 1.8% increase in spending. The wealthiest group spends only 61.7% of their income. Still, the increase in spending does reflect improvement in the economy in 2011, Furchtgott-Roth said. It's a reversal from the Great Recession and its immediate aftermath. In 2009, expenditures fell 2.8% from 2008, while spending dropped another 2% in 2010. Consumers haven't been rushing to the cash registers this year, either, as the continued rise in gas prices and troubles in Europe weigh them down, said Hoyt. "Spending is clearly growing, but not at the pace we expected to see at the start of the year," he said.